A great gift for anybody—including yourself! Please provide the following information to purchase your gift certificate online. 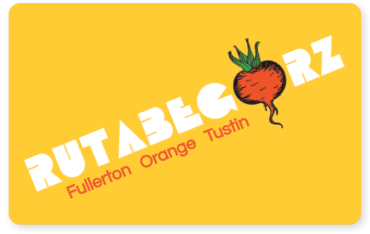 Gift Certificates will be mailed out within one day of purchase, are valid at all three Rutabegorz locations (Fullerton, Orange and Tustin), and never expire. Items marked with a red asterisk are required input. A receipt will be sent to the email address provided above. If you have any questions regarding a gift certificate purchase, please call (714) 731-9807 or email us at giftcertificate@rutabegorz.com. Please be sure to include your order number in all correspondence.